The dark roast, slow-steeped, and cold-brewed coffee comes served over ice. 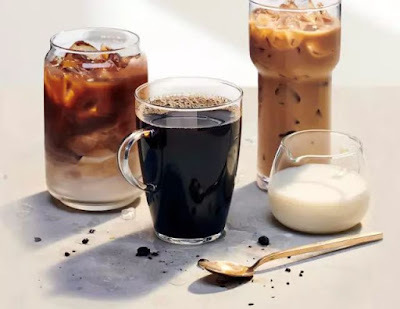 You can get it plain (black) or in two new, flavored varieties: Madagascar Vanilla Cream Cold Brew and Madagascar Vanilla Almond Cold Brew (made with almond milk). The new Light Roast and Dark Roast coffees are in the midst of being rolled-out with a full nationwide launch to be complete by late summer when they can be found in an updated coffee station along with the chain's current decaf and Hazelnut coffees. Both are fresh-ground on location prior to brewing. Light Roast is described as "a blend of Central and South American beans with hints of citrus, roasted nuts and chocolate," while Dark Roast is, " blend of Costa Rican and Colombian coffee beans that give this slightly-sweet coffee a rich, mellow finish." The arrival of the new coffees marks a revamp and expansion of the chain's coffee menu as well as the implementation of improved brewing standards.